Who do I want to be? 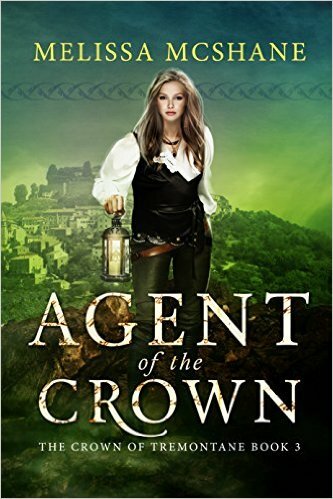 This is the central question of the well-written Agent of the Crown (The Crown of Tremontane Book 3) by Melissa McShane. SUMMARY (from back): Telaine North Hunter, Princess of Tremontane, is beautiful, spoiled, flirtatious, and the center of fashionable society throughout Tremontane. WHAT I THOUGHT: I enjoyed the previous two books in this series. They were thought-filled, inspiring, and romantic and book three lives up to that same standard. While the cast of characters changes slightly, focusing this time on Telaine North Hunter, niece of King Jeffrey, there were many carryovers from the first two books to keep continuity. As with the first two books, McShane weaves in a fundamental question we all ask of ourselves, who do I want to be? Telaine is a spy and as such acts in two roles, Princess and Devisor (an inventor of mechanical/repairer of “things”). And her covers have her confused as to who she really is–a Princess who could not be more superficial or a Devisor who, for the first time in her life, is coming to understand and appreciate the down-to-earth people of Longbourne. Telaine begins as a pampered young woman of the court who uses people for information. She is sent to the podunk little town of Longbourne where she initially wrestles with being rejected by the townspeople, wanting to fit in so she can accomplish her mission (or so she tells herself)–despite the fact that she knows she will not be in town after her mission ends. She acknowledges this oddity, but as she begins to fit in with the townspeople, she starts to appreciate their down-to-earth-ness, everything she hasn’t been at court. So begins her conflict of wrestling with who she is but more importantly, who she most wants to spend the rest of her life being. McShane continues to build out the world of Tremontaine and we see more of the little town of Longbourne where Exile of the Crown, the novella bridge between book one and book two in the series takes place. We experience the toughness/closed-ness of the townsfolk but get a much more in-depth look at what binds them together…trust and love, as the book unfolds. We see another glimpse of Zara North, former queen of Tremontaine, who, because of her magic she cannot die, has taken up residence in Longbourne. “Aunt Weaver” as she is known by Telaine, has settled in to a place that could not be more different than the palace as well. And her love of and loyalty to the townsfolk has her pressing the young spy about her true intentions. I loved Ben Garrett. What a sweet, but introverted guy. He is a great foil against which Telaine has to finally come to grips with the life she really wants. And when he comes after her, to the palace of all intimidating places, out if his love for her, I was cheering!